The success of the Edinburgh Festival is usually attributed to the foreign visitors who, every August, land in Scotland’s capital like overfed birds of paradise, their colourful rain coats flapping and their unblinking digital gaze ever curious. 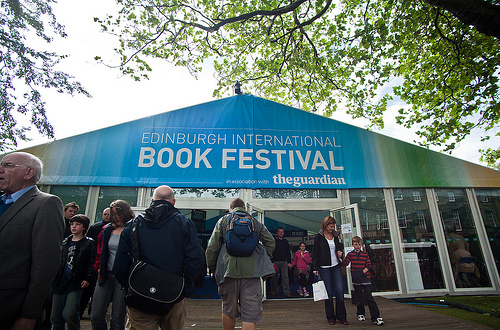 But in the confines of the Charlotte Square Gardens where the Edinburgh International Book Festival is held the plumage is a little more familiar. The Morningside matron settles down next to her cord clad Guardian reading husband whilst a New Town mum with a clutch of children buys ice cream treats. A whole class form a school coloured snake round the walkway whilst on the grass all sorts of people hang out or read. But don’t make the mistake of thinking the festival is staid. The Unbound programme, which is now in its third year, caters to a post watershed audience in its 9pm slot. As the events are free and unticketed there is nothing stopping even starving students from dropping by the Spiegeltent. Glasgow-based spoken word event Words Per Minute moves to Edinburgh for one night (Monday the 13th August) and two days later their Edinburgh rivals Illicit Ink take up the challenge mixing stage magic and storytelling. Unbound favourites Literary Death Match and Cargo are back. If you’ve never seen four writers battle it out in front an audience and four judges (Greg Proops, Rory Skovel, Chris Brookmyre and Billy Letford) with a silly, but literary game, to decide the winner get yourself along on Friday 17th.